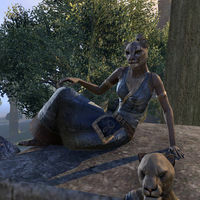 Hezura is a Khajiit merchant and celebrant found in Skywatch just outside the city, on the east side of the gate, one terrace level below the entrance. "The Skywatch fountains are so beautiful. This one feels so refreshed after tasting their waters." "Sugarmeat, sweetcakes, nectar bread, candied beets. Beets? This one will never understand the Altmer." "You have been to Telenger's Emporium, yes? If not, go. Go now!" "This one has a date tonight with a Bosmer from the Greenvine cartel. Trying to decide what kind of meat to bring."